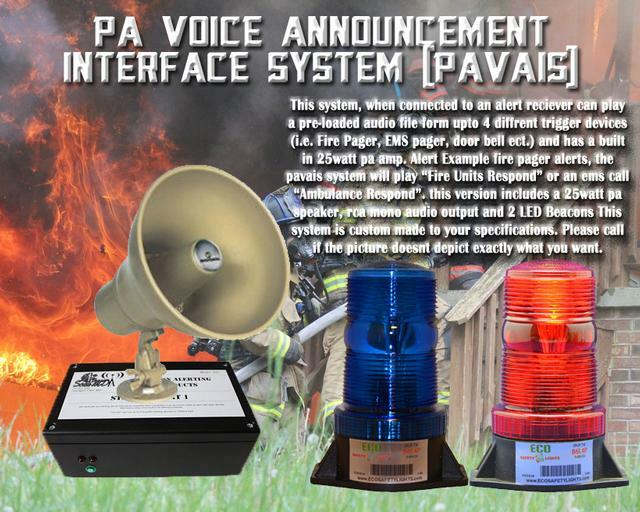 The PA Voice Interface System (PAVIS), When connected to an Alert receiver such as an amplified Minitor charger, Swissphone Pro Charger, or a Veetonix alert reciever, Will play a pre-programmed audio file such as "Emergency Theme", Federal Q Siren, Backdraft House Alarm, Ladder 49 House Alarm or any other audio you can come up with. This device is custom made to your specifications and can handle up to 4 trigger devices (i.e. Fire Pager, EMS Pager, Mutual Aid Pager, Door Bells, Telephone, Wake Up Call and More). The device itself has a built in 25 watt Audio amplifier so you can connect the provided PA Horn speaker directly to this system. If you need to add more speakers the PAVIS system also has an RCA Audio output for connecting to an existing PA system or Interfacing into a new audio system available through ScanMD (Contact us for Details). This system comes with a choice of (2) LED Beacons, (2) Wall Strobes, (2) Ceiling Strobes or LED Strip Lighting. Most Companies that purchase this item have separate fire and ems dispatch tones and have one audio file play for fire and a different file for ems. It can be considered a Pre-Alert System in some areas as the voice or audio announcement is instantaneous as soon as the alert device is triggered, No more waiting through 40 seconds of tones to hear what your station is due for. Some users have had a custom "EMERGENCY" Button Made and placed it next to there front door so "walkups" with an emergency get priority attention from the crews inside the station. Once again this system is custom built to the requirements of the buyer. If you cant seem to configure this device properly with the options included here on the product page please give us a call at 240-431-1159 if we don't answer please leave a message and we will normally return your call within 24 hours. Click on the Products Tab Above to view more information.